Obviously, it is not possible to describe the complete model design in a few paragraphs. The sketch above aims to give you an impression over the very basic structure of a microclimate model like ENVI-met. The general design is not only specific to ENVI-met but is used by almost all 3D numerical models. The Main Model is designed in 3D with 2 horizontal dimensions (x and y) and one vertical dimension (z). Inside this main model, the typical elements that represent the area of interest are placed: buildings, vegetation, different types of surfaces. To use a numerical model, the area of interest must be reduced into grid cells. The smaller one single grid cell is, the finer the resolution of the model is. On the other hand, making the grid cells small means that more cells are needed to cover a certain area. For example, a 100 x 100 m area can be organised in 100 x 100 grid cells of 1 x 1 m each or it can be organised in 20 x 20 grid cells with 5 x 5 m each. For each simulation, a compromise has to be found between the accuracy and resolution of the model and the number of treatable grid cells. As a rule of thumb, reaching 250 x 250 x 30 grid cells (or any other combination such as 120 x 80 x 30,…) can be considered as a large model needing a good amount of CPU time. As the available numerical power and memory storage is limited, several strategies are used in ENVI-met to cover as much space as possible by using less grid points as possible. One of these concepts is the usage of an additional 1D Model. To allow an accurate simulation of boundary layer processes, it is necessary to extend the model up to a height of 2500 m minimum. As it is not possible (and not necessary either) to extend the complete 3D model up to this height, the 1D model takes over the calculation from the top of the 3D model (which is, depending on your model layout, normally between 50 and 200 m) and the total model top at 2500 m (see also Total Model Height, Vertical Grid Layout). In addition, the 1D model provides the vertical profiles of all model variables for the inflow boundary of the 3D model (see also Lateral Boundary Conditions) . Another concept of covering more horizontal space without using too much grid cells is the usage of the Nesting Area. 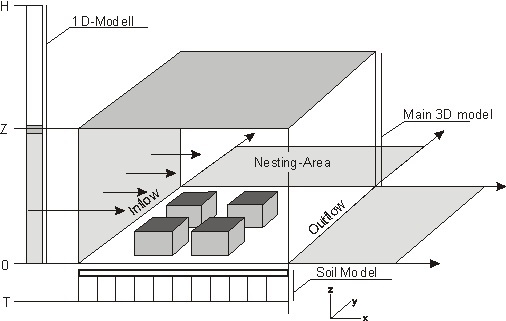 The nesting area is a band of grid cells surrounding the core of the 3D model. The further the cells move away from the core of the model, the bigger their size gets. This allows to move the model borders away from the core without wasting too much calculation cells. Click here to hear more about Nesting Grids. Finally the Soil Model is need to calculate the heat transfer from the surfaces into the ground and vice versa. Also, the hydrological part of the soil model provides important information about the available water inside the soil. This data is needed to estimate the maximum transpiration of the vegetation and the available water at the soil surface.